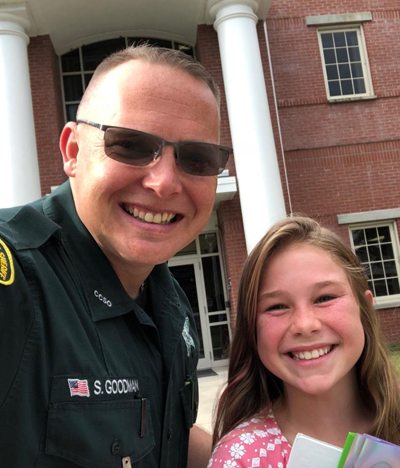 A School Resource Deputy (SRD) is a law enforcement officer who is assigned to either an elementary, middle, or high school. The main goal of the SRD is to prevent juvenile delinquency by promoting positive relations between youth and law enforcement. The SRD position encompasses three major components which allow the SRD to achieve this goal: law enforcement, education, and counseling. These three components allow the SRD to take a proactive approach to law enforcement. SRD's are not just "cops" on campus. SRD's provide all law enforcement duties on their campus. They educate the students by teaching law related classes and other related subjects in the clasSRDoms and counsel both students and parents on various topics. The SRD becomes involved in the students' lives as a positive role model. The intent is that the positive experiences students have with the SRD will bridge the gap between juveniles and law enforcement, and in doing so, help prevent juvenile crime. In 2005 the Citrus County Sheriff's Office School Resource Deputy Unit received national recognition as being a model SRD program. We take great pride in providing innovative educational curriculum. 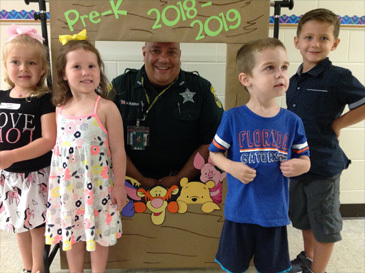 There are currently 19 School Resource Deputies assigned to each elementary, middle and high school in the Citrus County School District. This includes our alternative school (Renaissance Center) and WTC. The program also has 3 supervisors who divide the county and assist by providing additional coverage in the schools. Crime Stoppers provides a telephone number, a way to submit tips via the Web and a way to text tips, to encourage citizens in the community to volunteer vital information that will help law enforcement agencies fight crime.